As American drones strike terrorist targets, a fire of criticism bears down on the United States. 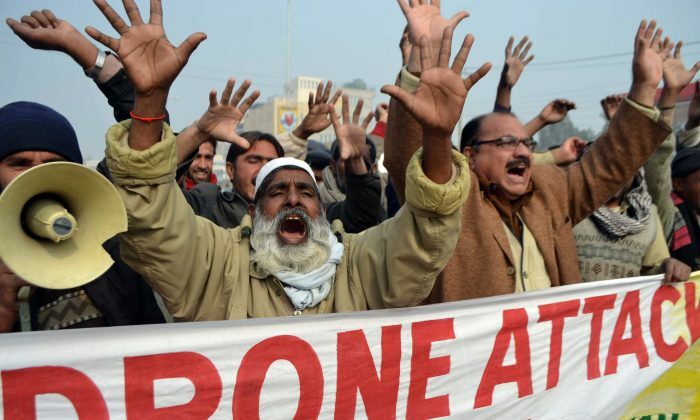 American-Pakistani relations have deteriorated, as Pakistan demands an end to drone strikes. Reports have shown the United States has sometimes been unable to precisely identify people killed by its drones. U.S. President Barack Obama has promised to scale down the use of drones. The polemical questions of morality related to their use might seem a sure sign these unmanned aerial vehicles (UAVs), commonly known as “drones,” are going out of fashion. Yet policy experts say they’re here to stay. Lethal drones, unmanned aircraft equipped with bombs, have become the most popular means of countering terrorism since 9/11. In combat zones, drones bring many advantages: they can be sent into hostile areas without risking pilots’ lives; they loiter for hours, without the limits of shift schedules for human personnel and without the limits of human endurance; they are able to gather and analyze huge amounts of intelligence data; last, but not least, they are relatively cheaper than manned aircraft, with basic models starting at $4.5 million. According to the nonpartisan policy institute New America Foundation, drone attacks aimed at suspected militants are estimated to have killed between 1,900–3,200 people in Pakistan from 2004 to 2012. As it turns out, in some cases it was not clear whom the drones killed. Earlier this month, NBC News published a review of classified CIA files, revealing that between September 2010 and November 2011, 114 drone strikes killed as many as 613 people, some of whom were not clearly identified. Related discussion: Was Israel in the right to target a weapons facility in Syria? Some were vaguely identified—in 26 attacks those killed are listed as “other militants,” and in four others as “foreign fighters.” In some cases, the death toll for a single attack changed from report to report. Criticism of the drones escalated further last week as the new Pakistani Prime Minister Nawaz Sharif warned, “This daily business of drones has to stop immediately.” His comment came after the killing of a major Taliban leader in the North Waziristan region. Drone use may, nonetheless, continue to rise. A decade ago, when U.S. President George Bush began his war against terrorism, America was the sole owner of 50 drones. Now, the United States has at least 7,500. And the United States is no longer alone. According to data compiled by the New America Foundation, more than 70 countries now own some type of drone, with a few of them possessing armed drones. Drones have only been used to lethally strike targets in six countries: Iraq, Afghanistan, Libya, Pakistan, Yemen, and Somalia, according to an American Security Project report. But global terrorism is changing, and drones cannot serve as the sole solution. During a speech at the National Defense University in Washington, D.C., in May, Obama described the new American counterterrorism approach. He admitted that, while the use of drones is effective, legal, and saves lives, the new realities dictate a new approach. “In an age when ideas and images can travel the globe in an instant, our response to terrorism can’t depend on military or law enforcement alone,” Obama said. Because American drones have been so effective, Taylor said, the rest of the world has been able to heavily constrain its drone use. “If you speak privately with European counter-terrorism experts, they frankly acknowledge that while their governments publicly criticize the use of drones, the primary reason there has not been a successful terrorist attack in Europe in recent years is precisely because of American drones operating over Waziristan and elsewhere,” Taylor said. As drones cull terrorists, a broader policy is lacking, according to Vanda Felbab-Brown, a senior fellow with the Center for 21st Century Security and Intelligence in the Foreign Policy program at The Brookings Institution. Felbab-Brown said the drone strategy must be couched within a larger strategy. For example, if the militant group al-Shabab in Somalia is a problem, then the solution must consider not only drone use, but also the vision for Somalia and a consideration of what is at stake in the country. Forming a strategy requires answers to questions such as, how does a group get support and legitimacy? Once the sources of its legitimacy are identified, the next step is to undermine them. What are the group’s technical skills and vulnerabilities? Next comes the method—if it is a group of five people, the strategy might be simply to arrest them, explained Felbab-Brown. But if the terrorist group consists of 10,000 people, operates in several countries, and easily intimidates and recruits members, the method involves far broader considerations than simply physical disruption, arrest, and incapacitation. Apart from the lack of a complete strategy, relying excessively on drones may bespeak a misunderstanding of the way of thinking and the culture of Islamic terrorists. “Drones are a stopgap measure employed by Western governments that have not yet developed the insight, the will, or the ability to address the threat of Islamist ideology,” wrote Taylor. And that is where the attention should be focused, Taylor said.